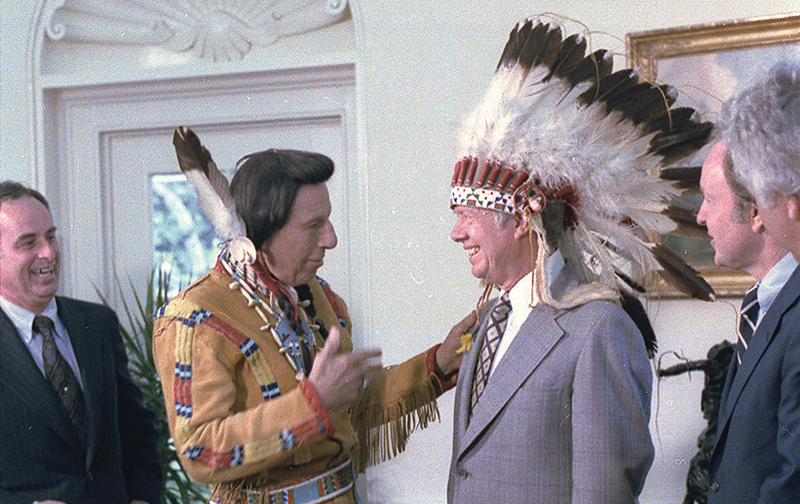 A long posting discusses Iron Eyes Cody, possibly the most famous Indian wannabe in history. It goes on to talk about Elizabeth Warren and why people exaggerate or invent an Indian identity. By Russell CobbIron Eyes Cody may have been a Hollywood Indian, but there’s more to the tribe than show business. There are many subcategories of Wannabes, but the most common member of the tribe we might call the Almost Native—the white person who claims one-sixteenth blood quantum, just enough to squeak by America’s arbitrary racial standards that designate who is and is not a minority. The most famous and most controversial Almost Native of the moment is Oklahoma City-born Elizabeth Warren, who is rumored to be a candidate for president in 2016. During her 2012 campaign for the U.S. Senate in Massachusetts against incumbent Senator Scott Brown, Warren frequently described “family lore” about her Cherokee forbearers as part of her hardscrabble, coming-of-age story. Conservatives mocked her for identifying herself as a “Native American” minority during two stints at law schools in the 1990s. While it appears that she never benefited from affirmative action for minorities and stopped listing herself as a minority lawyer by 1995, she has refused to back away from claims of Native ancestry. When Warren’s claims to Cherokee ancestry were scrutinized closely by genealogists, no one could find her ancestors among those named on the Dawes Roll, which the government intended to be a master list of Cherokee surnames, finalized in 1906. (Although they did find one ancestor during territorial days who had actually boasted of killing a Cherokee.) Like many dubious narratives of whites passing for Native, Warren’s story takes many twists and turns, some of which receive a gloss in her new memoir, A Fighting Chance. In the book, Warren weaves her “Native American heritage” (specific references to the Cherokee have now disappeared) into a narrative of working-class struggle, with her “mamaw and papaw” handing down stories and recipes from their days in Indian Territory. And then there’s Aunt Bee, who told Liz Warren that her papaw had inherited high cheekbones from his Indian ancestors but did not passed them down to the little girl. It’s all part of a home-spun narrative of authentic Americana: Daddy worked hard as a janitor, but had a heart attack and couldn’t pay the medical bills. Mama was devoted to her family, but sometimes didn’t have enough money to put food on the table for the four kids. Eventually, little Liz had to work, too, before she dropped out of college at age 19 to support her husband’s professional goals. Then she picked herself up by her bootstraps and put herself through law school in the wake of a divorce. It’s like a PG-rated Loretta Lynn or Tammy Wynette song with all the cheating and drinking purged from the storylines. A lot of people scoffed at fair-skinned, blue-eyed Warren’s claim of Native American heritage. But, as an Okie myself, I instantly recognized the narrative. It has an undeniable pull and a certain degree of truthiness, as Stephen Colbert would say. The mythic Native ancestor in the white settler family lends a folksy, feel-good element to a narrative of colonization, exploitation, and plunder.